The Las Colinas Area's Personal Transit System (APT) service is scheduled to return to service on Monday, April 2, 2018. Friday, March 30 will be the last day for Route 503 buses to operate. 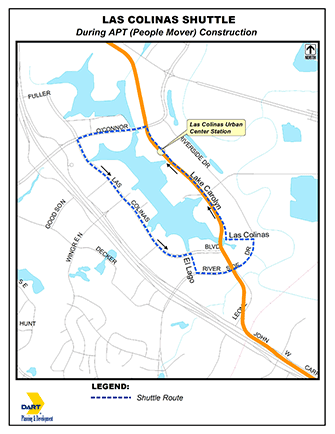 The Route 503 buses serve the Orange Line's Las Colinas Urban Center Station and operate in a counter-clockwise loop over Lake Carolyn Parkway, Riverside, Las Colinas Boulevard and O'Connor Boulevard. Hours of operation are 6:00 a.m. to 6:00 p.m. on weekdays. Frequency will be approximately 15-20 minutes. The shuttle, like the APT, is free to customers. Click here to view the Las Colinas Shuttle schedule (opens in a new window).